There were some warm, windy days last week and many sticks were blowing off the trees into the yard. 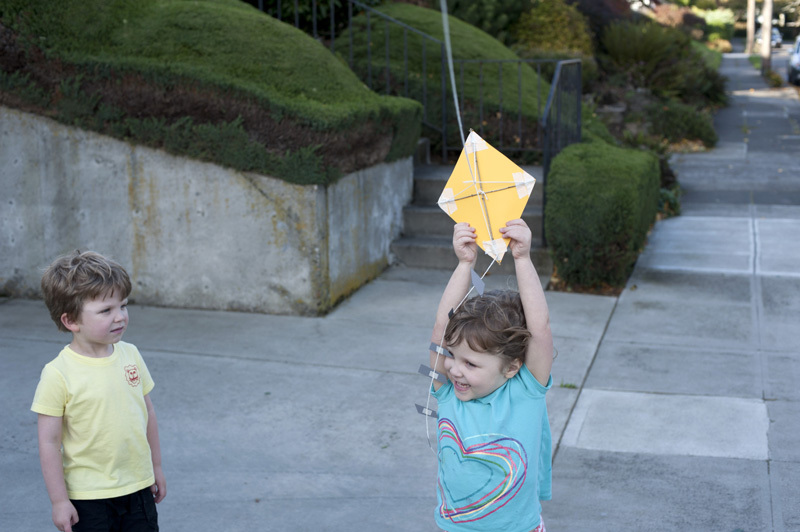 We had the spur of the moment idea to try making a kite. 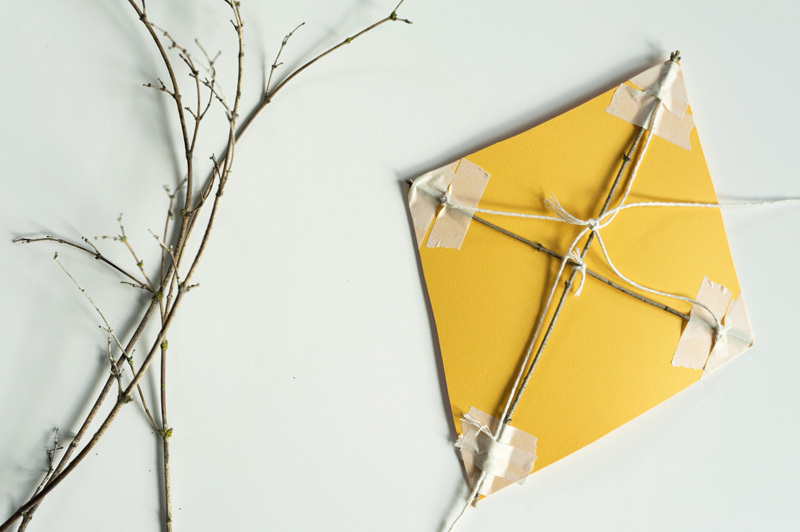 So we gathered a few sticks, cut some thick paper, got out the tape and string and in ten minutes we had a kite! I was really surprised to see that it actually flew. The best part was the kids’ excitement; the building and especially the flying. Their favorite thing to do was chase after me while I ran with the kite. Look at those faces! My little crumb is going to LOVE this fun project! Oh my God, I've misspelt engineering, I am ashamed. the eyes are shining and the mouth is wide with a smile! cool project, simple and quick... and Amsterdam is always windy...! 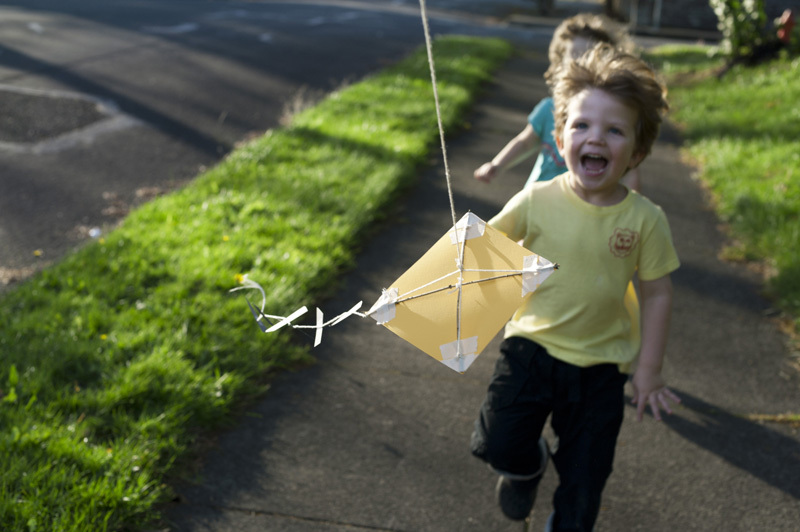 That last photo is fantastic, as is the kite! 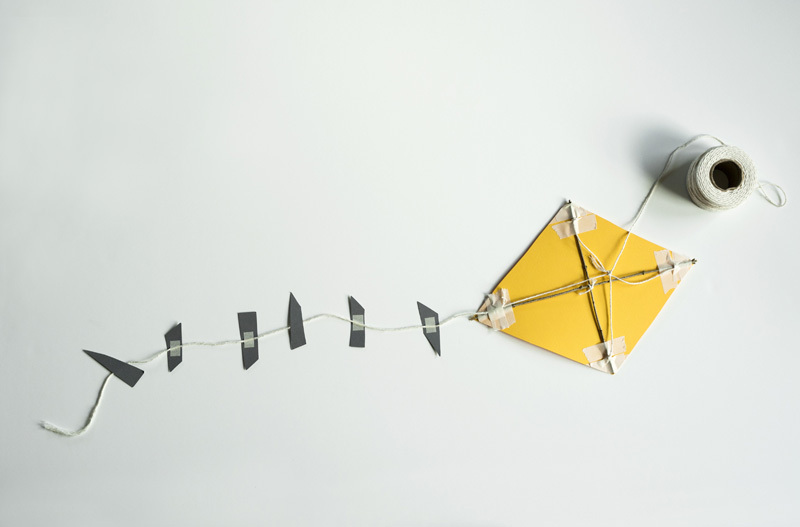 Have you ever tried the indoor kite? I once did this with a class of 4 year olds - went down a storm. It is lovely! I like the tail feathers best, they show the impromtu/spur of the moment process. These projects are often the best aren't they? Thanks everybody! Yes, definitely try this out! It's a lot easier than I was expecting. jfidz - That link is great! Looks like those would fly really well! Must try that out. Thanks! This might be a silly question, but how do you get the kite up in the air. I tried it with my kids and we could not get it up. Not that it really mattered to them, they just ran around with it. Just in future I would like to fly a kite. 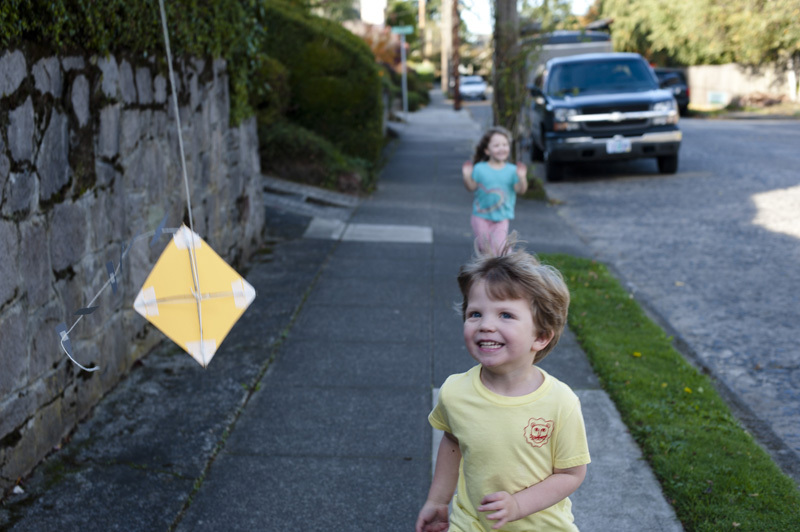 Running with the kite was my kids' favorite part too. Maybe it wasn't windy enough when you flew yours. It needs to be a very windy day. 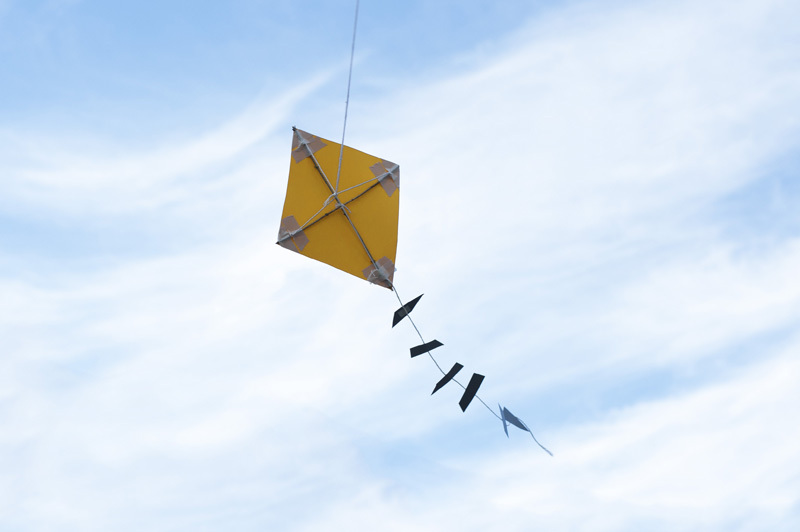 HI Joel, great kite! on a recent windy day my 6 year old son and I made a kite with an old bandanna, some thick floral wire and tape. It was one of those "mommy I need to make this right now" projects, so not the best materials, but it worked for a bit. He wanted a really big kite, but I think your smaller version would have been a better idea though. 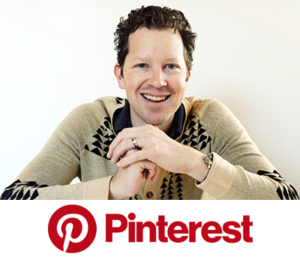 I wanted to let you know about this cool site we found recently. It is all about creating stuff out of recycled materials and tape, which is a daily event in our house. This guy took it to a new level, and I find it inspiring. Your creations are certainly more artistic, but thought you'd find some inspiration here none the less. looledo.com congrats on all your success! Hi Tagan. I know what you mean about those "make it now" projects. That's the best way to get stuff done sometimes! The looledo link looks awesome! Some very cool ideas on there. I've added it to my bookmarks. Thanks!!! WOW! That looks great and like a lot of fun! My kids and I also love to play with kites as well! 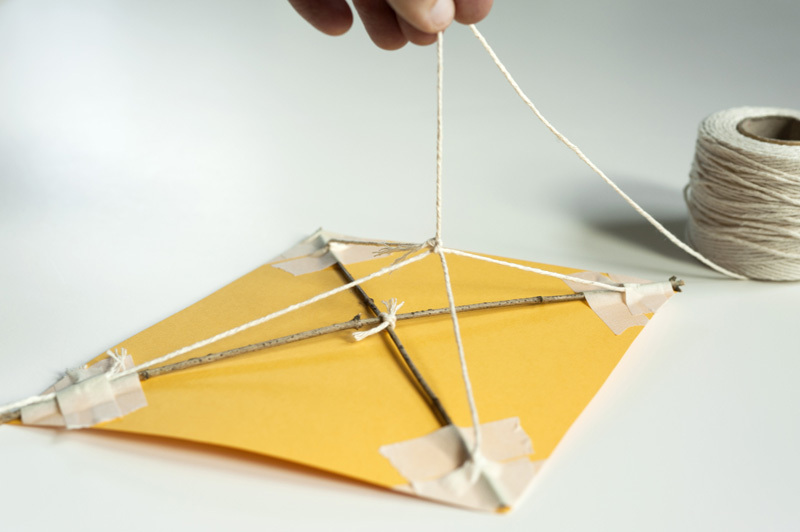 I want to make a kite! That is great! Where has my head been stuck? I mean I live right infront of the beach! Excellent things you do and its almost all recycled. Super!